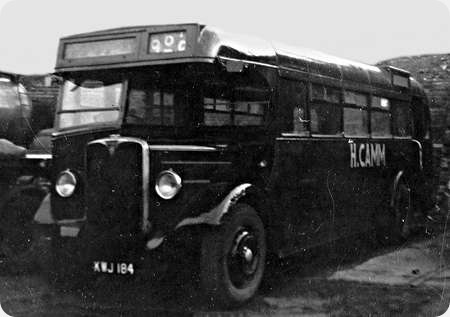 A few early post war Sheffield single deckers found their way to Contractors on withdrawal and this example is with H Camm. 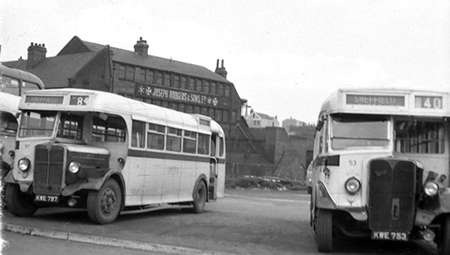 It is seen on the car park near Pond Street Bus Station in 1963. 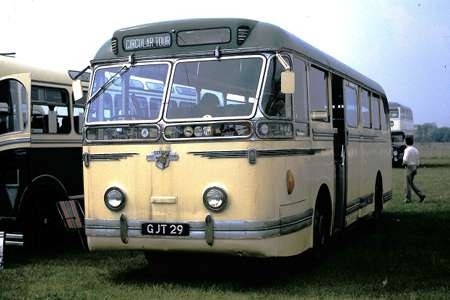 The bus would have been a regular performer on Peak District services during its Sheffield career, particularly on the 37 to Bakewell and the 84 to Buxton as it was a C fleet bus. I’m surprised not to have seen a comment yet on this fine vehicle, so here goes! This AEC demonstrates that the designers of a really good-looking vehicle put function in very first place, but also let a good eye dictate the details, all of which they’ve achieved to perfection. Interesting that this posting comes so soon after Roger Cox’s unearthing of that poor Austin K3 with its April Fool Nightmare "coachwork"—which I hope one day turns out not to be by Bush and Twiddy. I’ve always found buses far more interesting than coaches simply because there’s so much less scope for "stylists" to let their imagination run riot on a vehicle that has to meet as many demanding criteria as a service bus must. Yes Ian and Ian, splendid buses that stir childhood memories for me on the Bakewell 40 via Calver Sough and 84 Buxton. Living at Ecclesall, as a small child I was occasionally treated to a trip to Bakewell with my mother and of course the favoured seat would be at the front behind the engine and the heater. As far as I can remember, this batch buses had the whopping Clayton Heaters affixed to the bulkhead but I may be wrong as I don’t remember any other post-war buses carrying these heaters. I think most if not all early post war single deckers for Sheffield JOC (B&C fleets) had the Clayton bulkhead heater fitted. I too travelled on these to Buxton and Bakewell and on similar PS1/PS2 on the Manchester services. 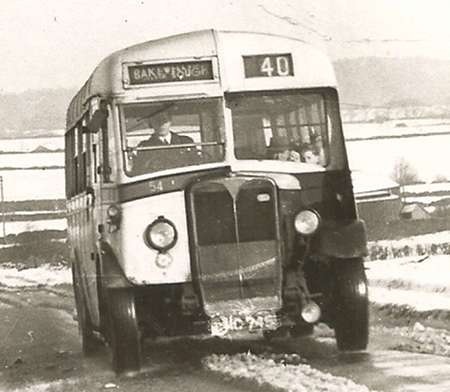 Do you remember this type of bus being fitted with rear wheel chains to cope with snowy weather? They made one hell of a noise on Ecclesall Road. As a teenager in the mid 60’s I made the trip from Denton (east of Manchester) to Sheffield on the 39. A leisurely ride including a break at the Snake Inn. I was always fascinated by the blind which showed "Sheffield via Ashopton" but I could never work out where was Ashopton. It was only some time later that I discovered that Ashopton together with Derwent were drowned villages and lay at the bottom of the Ladybower reservoirs but nobody had bothered to update the destination blinds. I note Ian Wild’s comment that PS1/PS2 were used on the Manchester services: I am sure that the bus I rode on that day was an AEC because the radiator caught my attention. There were no AECs in the part of Manchester where I lived at that time. Could it have been a one-off allocation I wonder? David, I suspect that your memory serves you well. In some personal memories of Dennis E Vickers, a former Sheffield bus operator and enthusiast, he well remembers one of his first journeys over The Snake (Route 39) on an ageing Sheffield 1947 AEC Regal 1, sitting behind the large circular heater on the front bulkhead of the rear entrance half-cab saloon as it whined and rattled over the moors. Hello John, thank you for your confirmation that AEC’s did work the 39. The photo at the head of this thread is definitely the type I rode in. It would be good if someone could provide a photo of this type in Sheffield colours…..please. I did make an error in my original post: it was the mid 50’s and not the mid 60’s when I made that trip. Sheffield still had trams running then Are the personal memories by Dennis Vickers in book form or can they be accessed on the internet? Here’s a picture of a couple of Sheffield’s Regals David. As far as the memories are concerned, they are neither in book form nor on the net unfortunately. They were a short article in an amateur periodical of a local enthusiasts society many years ago. If you will let me have an email address, I will happily send you a scan of the rather faded ‘remains’ of the article. A very interesting Sheffield 54 ex demo AEC. John, Many thanks for digging out the photo: it is much appreciated. It also confirms my boyhood opinion that even in 1957 (I think) they looked so old fashioned. Ken, an interesting photo indeed. It looks as if it’s a half-canopy front; would that have been unique to Sheffield I wonder? I have no idea whether this bus is a half canopy or not it is a photo from my great uncle Frank Brindley a freelance press photographer who took a lot of bad weather photos all I know is this bus was a AEC demo bus. Quite right David, Sheffield’s Weymann/Regal 1 No. 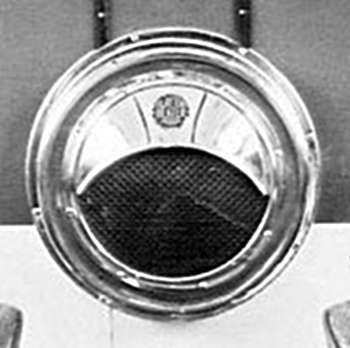 54 was indeed a half-canopy front and as such was unique in the Sheffield fleet. 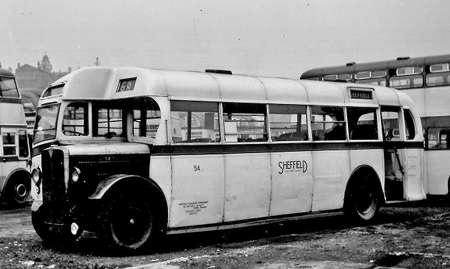 The late Charles Hall FCIT in his Sheffield Transport ‘bible’ stated that this was a demonstrator ‘on loan’ from January 1940 until brought into the fleet in December of that year as number 54. It was believed to have been at the last Pre-War Commercial Motor Show. 54 was apparently a well-liked and reliable vehicle, lasting until 1955 in service before being converted into a canteen bus with withdrawal coming in January 1961. I bet they were glad to grab it while they could. Here is a view of YXA 372, to complement HDA 554E posted a while ago. YXA is another relegated to "staff bus" duties with Dan Air, and seen at Lasham. The layout of the indicators suggests very strongly that she started life with Grey Green or an associated company. She was photographed in January 1976. I apologise for the fact that a van is blocking, but I couldn’t get a better angle. This Bedford was new to Fallowfield and Britten in 1960 and seated 41 in a front entrance body. Despite appearances, the paint on coach and van is green! It’s a "dud" slide from that point of view. I don’t recall the make. Pete. I don’t think it’s so much a dud slide as a dull green – almost mat – and you probably couldn’t have made much more of it anyway. It would be interesting to know exactly how many Leyland/Bedfords there were? It seems that, for what they were, the Leyland powered Bedfords were well thought of. Were they, in the main, big groups like Grey-Green? The shade of green on the slide isn’t that far removed from the shade of mud green employed by Dan Air Engineering for their vehicles. I know that many Bedford TK lorries had Leyland engines. Apparently those in the know could distinguish the SB8 from the SB1 by inspecting the headlamps, as it had 24-volt electrics rather than 12. So it’s possible that there were other differences, making the Leyland-engined model into more of a premium product. I never personally came across an SB1; it must have been a slug with its Bedford 300 diesel. The SB3 was far more common with its smooth and quiet petrol version of the Bedford 300. It was the smooth, quiet and fairly lively running of the petrol OB which endeared it to so many people. The SB3 was (almost) the last gasp of this "technology" and was very popular with small independent operators. There was a VAM3 – but I’m only aware that Salopia operated any of them. Petrol was becoming passe and very expensive compared with diesel operation even though – big AECs and Leylands apart – they were slow, noisy and smelly. To David Oldfield, I am 99% certain that the Bedford SB8 had a Leyland 350 engine, not a 330. 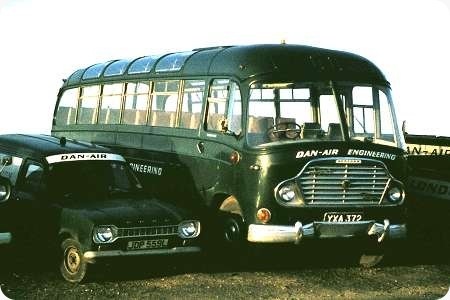 The Bedford SB featured in most operators fleets at some time. I have always liked them. Here are two views of GJT 29 for your perusal. She is a Leyland Royal Tiger PSU1/16, with Leyland’s own C41C bodywork, and is seen at the Southsea rally on 17 June 1984. The odd feature about her is that she was never a PSV. She was built in 1953 (according to the PSVC listing) as a staff bus for a mining and/or quarrying firm in the Purbeck area of Dorset. PSVC lists the original owners as Warwickshire Miners and I’m supposing that the Dorset operation was a subsidiary. She was in use with a Scout group in the area at the time of the photographs. The Purbeck area of Dorset there is an Oil field still producing a lot of oil, so it is probably that site in which GJT 29 transported the staff. The mining industry had various convalescent homes around the country which were regionalised (S. Wales, Yorkshire, Warwickshire) and the latter had a home in Swanage (Durlston Court). This one was called the Warwickshire Miners’ Convalescent Home, which is the full title of the owner of the coach. I wonder if the coach had been pensioned off by then, but bought/passed on for the nearby oilfield’s employees. I believe the Royal Tiger was used by the Warwickshire Miners’ Convalescent Home (Durlston Court, Park Road, Swanage) to transport its patients. Here she is in preservation. www.flickr.com/one According to Preserved Buses (2006 Edition), she was owned by Massingham of Slough but that may have changed by now of course. There is a Warwickshire Miners Convalescent Home in Swanage. I believe that it has since been demolished. This maybe the reason for the Dorset registration. Stuart, GJT is listed in the PSVC edition for 2012 as being with Massingham, Slough. I’ve no idea what condition she’s in!
. . . and I forgot! Pennine still have the former demonstrator, MTD 235. My sources tell me she’s stored in the garage in Skipton (the former Ribble place in Broughton Road) but others say she’s at Barnoldswick. The Ribble Vehicle Preservation Trust used to have one, possibly two, but their website didn’t mention them when I looked last. Many quality vehicles ended their working lives as workmens or staff buses, but not many would have started that way. You would expect a new vehicle to have been from the lightweight end of the market rather than a Royal Tiger. To be fair, Ronnie, it’s not clear that it did start as a workmen’s bus. But you make a good point that, even if the vehicle had been acquired by the convalescent home for patient use, why was it such a heavyweight? It’s all shrouded in mystery, as ever! Thanks very much….If I track down GJT later this year, then I’ll update everyone….Fingers crossed she’s still in one piece ! The various "Unions of Mineworkers" – Warwickshire, Durham, Kent etc (the National Union of Mineworkers [NUM] was a federation of the regional unions/areas) each had their own convalescent homes for sick/retired mineworkers. 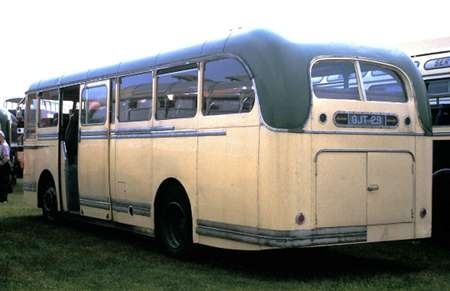 A coach would be required to transport residents around the local area, and also to ferry residents between the home and place of residence: I would assume that the coach would spend most of its time on "local" work around the home, with regular – but less frequent – trips to collect/return patients to the place of residence, so perhaps it made sense to register the coach in the area where it would spend most of its time (Dorset) rather than Warwickshire. I’m sure a lightweight could have done the job, but a heavyweight would have done it better and would make a "statement": don’t forget that until the mid-1980s the NUM areas were very wealthy bodies – a new heavyweight would make a powerful statement of "who we are" and "how we care for our members", both to those inside and outside the organisation. Ribble 377 the all Leyland Royal Tiger PSU/13 ERN 700 is with the Ribble preservation group and restoration is on going, though it is a 44 seat Bus variant.